Movavi Video Editor 14 as the name suggests is a video editing software that directly competes with various video editing software for personal use. When we talk about free video editors then Windows Movie Maker will be our first choice. However, the Windows Movie Maker is outdated and doesn’t stand anywhere near today’s video editing standards. If you are looking for a quality video editor at a reasonable price then we will recommend you Movavi. It fits your budget and provides great functionality in editing a video. I am impressed by the features of the Movavi Video Editor and it has almost every useful feature like cut video, crop that I need for editing a video or create tutorials for my YouTube channel. So in this post, we present to you Movavi Video Editor 14. In this article, you will learn about this video editing software and we will give you reasons why you should buy this software. Movavi produces a wide range of multimedia programs that ensure you can have fun with your videos, music, and photos on any platform and any device. They develop easy-to-use, powerful and effective programs that inspire people to process, enhance, and share their content. They are developing such software since 2004 and we are reviewing one of their useful software, Movavi Video Editor 14. Easy to use video editing software for Mac and Windows. Provides all basic video editing options like cutting a video, crop, and rotate it. Contains a lot of filters that you can apply to a video. It also has a video creating and editing wizard known as montage mode. It will guide you in creating a video by using multiple video clips and photos. Essential features like callouts, highlight and conceal are available in this software. With callouts, you can point out anything in a video through animated arrows, shapes, and circles. With the conceal feature you can blur a specific area of the video to hide any info or faces. With the ‘Titles’ you can create the intro for your video and edit text. It has built-in animated templates for titles. Lets you combine two videos for a side-by-side video playing. Supports all popular video formats including 4K. Yes, Movavi software is 100% virus and malware free. We scanned the software with our paid Avast Internet Security and it didn’t find any issues. Our antivirus neither blocked nor showed any warnings. So it is pretty safe to use and install as Movavi is a trusted software developer as reported by its users around the world. When you open the software then you will find four main functions on the leftmost side of the software windows. There are three options that are fixed and the fourth one is replaceable. The first option is for importing the media files like audio, video, and pictures. The second option with a magic wand is for the filters. The third option gives access to the transitions. And the fourth one is customizable you can click the menu icon below the fourth option and select any one option from the list that you want to use the most during video editing. 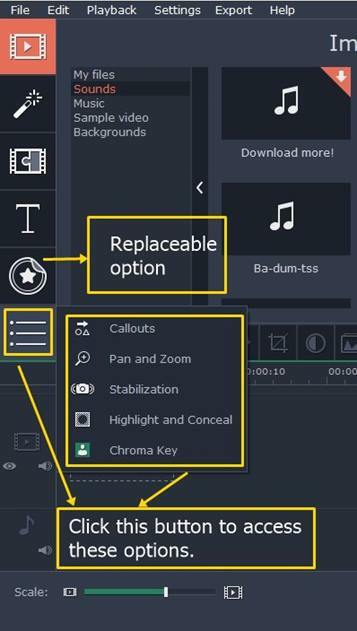 These options include ‘callouts’, ‘pan and zoom’, ‘stabilization’, ‘highlight and conceal’, and ‘chroma key’. On the rightmost end of the software window, you will see an inbuilt video player. Below the player, the timeline is located and above it, you can see basic video editing tools like split, crop, rotate, color adjustment, recording a voice-over, and clip properties. Before editing videos you should know how to add media files to the editor. Click the ‘Import’ button on the top left side and click ‘Add Media Files’ and import the videos that you want to edit. If you have a folder in which many videos are saved then click the ‘Add Folder’ option and import files from it. If you want to record video from your webcam then use the ‘Record Video’ function. The webcam will only record the video but won’t import it automatically. You have to manually import the recorded video from this directory ‘C:\Users\PC-Name\Videos\Movavi Library’. You can also record screencast but that is a separate paid feature that we won’t be discussing in this post. Now you have learned to import media files. Now we will discuss video editing on Movavi Video Editor. One good thing about this software that I like is that after loading a video it automatically splits video and its audio. So I can delete the audio and change it with some other voice-over. I can also mute the audio. Check the following image for more info. 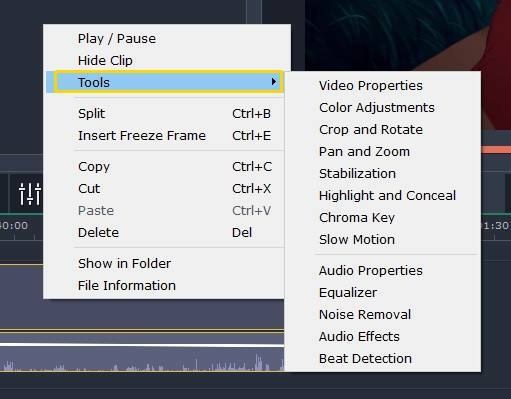 ➜ When you have loaded the video in the editor you just have to click it once in the timeline and after that, you can use all the editing tools like split, crop, rotate, color adjustment, record voice-over, clip and audio settings. ➜ In the ‘Clip properties,’ you can increase the volume up to 400% as some video files have low audio. You can also change the video playing speed and finally, you can select the reverse function to save the video in reverse order. ➜ Clicking the ‘Clip properties’ icon will open all the tools and settings that can be applied to a video just above your video’s timeline. Just scroll down and find other options like color adjustment, crop and rotate, Pan and zoom, Stabilization (removes camera shakes), Highlight and Conceal, and Chroma Key. ➜ Since these tools are self-explanatory so there is no need to explain them in detail. You can access a particular tool by right clicking on the video in the timeline. This is the shortcut. See the image below. ➜ This is indeed a very useful feature. This feature lets you blur out a particular area in your video. You can either blur out a face or blur a text that is appearing in the video. It also lets you highlight some important information in the video. ➜ To use this function first go to the ‘Highlight and Conceal’ by simply right clicking on the movie file and then Tools>Highlight and Conceal. Now follow these steps below. ➜ When you open this sub-function of the editor then you will see ‘Conceal’ option above the timeline. Next, to it, you will see a square and a circle. ➜ The square and circle define the shape of your area that you are going to blur or pixelate to hide something. ➜ Simply click square or circle and the corresponding shape will be seen in the video player. Now just drag this shape anywhere on the player and place it over the face or any info appearing in the video. ➜ Now click the droplet button to blur that area. Set the opacity to 100%. Set feathering to 100% to smooth out the sides of the blurred area. You can anytime change the size of the square or the circle by dragging its edges using your mouse. ➜ If you want to pixelate the selected area then click the ‘Pixels’ button second to the right of the droplet blur button. Click the play button in the player to preview the pixelated or blurred area in the video. ➜ Select the size of the pixels and your selected area will be hidden under large pixels. You can similarly use the highlight function from the same menu. But don’t forget to set the opacity to at least 40% or above. ➜ The only problem with this sub-function is, that the blur function is applied to the entire length of the video. There is no option to set the timing for how long we want to blur a specific area in the video. But there is a trick to this, you should split the video into multiple files and only apply use the blurring editor on that split video. Working with split video files is easy as you will always have the option to apply filters on only selected parts of the video and not on the entire length. So it's up to you whether you want to apply filters to the entire length or just work with split cut video. To apply filters simply click the ‘Magic Wand’ button on the leftmost side of the software window. You will see all the filters here. Just click once on any filter to see its preview. To apply the filter on a video first click on it to select it in the timeline. 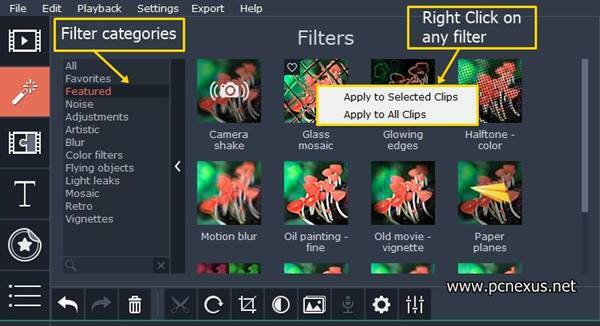 Then right-click on any filter and select ‘Apply to Selected Clips’. Click the play button in the player to preview. If you don’t like the filter then click the undo button and re-apply some other filters. You can apply multiple filters to a single movie clip and remove them one by one by clicking the white start with a green background on the video thumbnail just below the timeline. Clicking this white star will show you all the filters applied. Select any filter and then remove it by clicking the 'Remove' button. There are lots of filters in Movavi Video Editor 14 so you can experiment with them in an easy-to-use manner. Similarly, you can also check out the ‘Transitions’ just below the ‘Filters’ option. Creating a Side-By-Side video is quite easy. You should have two videos loaded in the timeline. Now to create a side-by-side effect just drag any video from the timeline and drop it above the other video in the timeline then click the ‘Clip properties’ button. 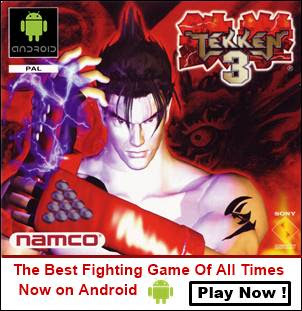 It will give you three options above the player like picture in picture and cover. Select ‘Side by side’ and also select the type of the side by side video next to it. Click the play button to preview the side by side video. The click the 'Apply' button on top right corner. You can add text, captions, or watermark your videos with custom text. Simply click the ‘Titles’ option then click ‘All’ and find the ‘Simple text’ option. Right click on it and select ‘Add to Current Position’. ➜ The text will be added just above your video in the timeline with a very short length. Hover your mouse over the text in the timeline and hold and left click and drag the length of the text to entire video. ➜ You can increase or decrease its duration this way. You can simply drag and drop the title text anywhere on the video timeline so that it appears at the right place at the right time. ➜ After adding the text in the timeline double-click it to access settings that will let you change the text font, color, and size. These text formatting settings are available over the inbuilt player. Callouts can be used to highlight or point out something important in the video. Many a time you might have seen in films or tutorials that a particular gets circled out or an animated arrow points out something. To use callouts simply click the ‘Menu/More’ button for more options in the leftmost corner of the software window. From the menu select ‘Callouts’. Now you will see different callouts just before the player. Just single click on any callout to see its preview. To apply the callout to your video right click and select ‘Add to current position’. Now just drag and drop the callout anywhere on the video in the player. Drag its edges to increase or decrease size. Just above the player, you can edit the duration and the speed at which the callout will appear. After you finished editing just click the ‘EXPORT’ button. An export dialog will appear. Here you can select different video formats in which you want to save your edited work. Here you will find video saving options for smartphones and 4K TVs also. You can also directly upload the video to your YouTube account. But for that, you have to give access to Movavi. You can skip this if you have privacy issues with identity. After selecting the format and quality click the ‘Start’ button. The conversion will take time according to your project length. You can also save your movie project and work on it later. To save a project go to ‘File>Save project’ or simply press ‘Ctrl + S’. The Easy Mode lets you create a montage and it automatically guides you to add pictures and images. You can also select the backing tracks from the list. It’s a quick way to create a video from your family photos. At this time we are having some issues with the current software version as we can’t see the preview. It might be a bug that will be fixed in next version. You can check this detailed tutorial for using the easy mode to create a montage. Movavi Video Editor 14 comes with a 7-day trial period with full features and functions. But the videos that your produce or edit will have their official watermark on them. To remove the watermark you have to purchase the software. The good thing about this software is that you have to only buy it once and don’t need to renew it every year. Coming to the price, well the price varies in different countries. Suppose if you live in the USA then it will cost you around $39.95 for the personal version. I am from India and here I can purchase this software for as low as 1,390 INR just for the one-lifetime license. And I will be very much happy to replace the Windows Live Movie Maker with Movavi Video Editor. Do remember that you are getting a lifetime license that you don’t need to renew yearly. And you will get some program updates for free for the lifetime until they release the next version. For correct price estimate please check the official website. Currently you can avail big discounts during the Christmas December promotion. Check the link below. Supports almost all types of video formats. A complete step-by-step guide is available on the official website. Has the most useful features that are blurring out faces and a particular part of the video. Supports Intel hardware acceleration for faster video processing. Features pre-loaded media including images, clips, backgrounds, and music. Inexpensive windows movie editing software . While creating side-by-side videos we are not allowed to change the aspect ratio of the two videos. Neither we can move the videos to bring the subject in the view. The videos play in their original size. So this feature needs improvement. You will need a good video editor at some point in your life. Shooting a video with your camera is not enough. You will need a video editor to properly credit your work, add a copyright mark, add effects and transitions, and moreover cut unwanted parts from a video. Free software doesn’t work great because they come with very limited features. So its better to buy an easy video editing software that is worth your money and Movavi is the number 1 choice when we talk about the total features given for the price you pay. At just $39 you can buy this software and use it for the lifetime on a single PC. If you want it for half the price that is $19 then first install it then uninstall it then take the Movavi survey, I bet you can buy it for just $19 but for a limited time only. Most people don’t believe the software reviews that they read on the internet. So what you have to do is to use the Movavi video editor yourself for 7 days with full functionality and then decide whether you want to buy it or not. Even if you buy this software then you can still take back your money because it comes with 30-day money back guarantee. If you are not satisfied then take your money without any questions asked. You have to buy it once and don’t need to renew every year. For just $21 (Indian market) and $39.95(USA) Movavi video editor, 14 is currently the best video editing software that you can use for personal usage. If I want a video editor for personal use then Movavi will be my first choice as it is the cheapest software that you can buy for video editing. I can create videos using it even for my YouTube channel without spending a very big amount.